Colleen was born June 8, 1924 in Dayton, Ohio to Dayton Streetcar Motorman Aytchie and Mattie (Roach) Reynolds. By the time she was 16, her family moved to Jackson County, Kentucky. 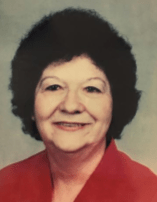 During World War II, Colleen took a position at the Blue Grass Munitions Depot in Richmond, Kentucky and later at Wright Patterson Air Force Base back in her home town of Dayton. She married after the war was over. Colleen joined the Hamilton Police Department as a Records Clerk on September 16, 1957 and worked in the Records Section for 27½ years until she retired on April 26, 1985. She also taught adult and children’s Sunday School classes at Darrtown Baptist Church. Records Clerk Story died at Fort Hamilton Hospital on January 16, 2018 at the age of 93. She is predeceased by her husband of 23 years, Walter Lee Story (1970), and brothers, Larry Reynolds and Carson Reynolds. Records Clerk Story is survived by her son, Michael L. (Connie) Story; grandchildren, Michael T. (Jeni) Story, and Bryan L. (Rebecca) Story; and great grandchildren, Kellen, Josie, Jesse, Jase, Jack, Justin, and Jorja Story. Visitation will be held from 11 a.m. to 12 p.m. on Friday, January 19, 2018 at the Weigel Funeral Home at 980 N.W. Washington Boulevard in Hamilton. A funeral service will be held at Noon. Burial to follow at Rose Hill Burial Park. Memorials may be made to the Immanuel Baptist Church, 1770 Eaton Avenue, Hamilton, OH 45013.